Bianca Naturals, the product manufacture, is a new kind of beauty company that is passionate about skin and is dedicated to providing all natural yet incredibly effective solutions for healthy, radiant skin. Bianca Naturals Pytoceramides replenishes natural ceramide levels – restores skin from within – reduces fine lines and wrinkles – smoothes rough aging skin – increases skin hydration – improves the skins structural integrity and “glow” HOW IT WORKS: As we age, our bodies produce less of a lipid (fatty molecule) called ceramide. This results in wrinkled, rough, aged skin. Phytoceramides are the plant-derived equivalent of your body’s ceramides. When taken phytoceramides replenish the lost ceramides thus restoring and refreshing the skin from within. WHY BIANCA NATURALS – Based on the most effective phytoceramide patent – Ceramide-PCD by Oryza – Clinically proven to be 35% more effective than wheat based phytoceramides – Ceramide-PCD has been used for decades and is extremely popular in Japan – As a bonus: Bianca Naturals Pytoceramides includes the daily recommended allowance of vitamins of A, C, D and E – Gluten Free – 100% no questions asked money back guarantee. Ceramide-PCD (Providing glycolipids, phytoceramides & glycosylcerimides) – 40 mg.
Other Ingredients include: Vegetable Cellulose Capsule, Purified Water, Magnesium Stearate, Stearic Acid, Silon Dioxide. This product comes in 30 capsule containers (a 30 day supply). The recommended dosage is 1 capsule daily. 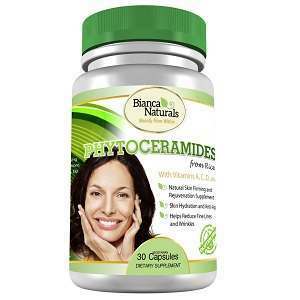 Bianca Naturals Pytoceramides is sold on Amazon for $15.97. The product is sold by Amazon exclusively and not be the manufacturer. With an Amazon gift card the product can be purchased for $12.92 currently. The product source advertises a 100% no questions asked product return and refund policy but provides no information on how this policy works in the product source. The product manufacturer does provide a company address in their website but no contact phone number. Amazon, which sells the product, does have a customer service contact number and includes in their site a number of testimonials and recommendations about this product. Amazon also provides for product returns and refunds. The Amazon site explains in detail how product returns and refunds are made. This product is moderately priced for a one month supply, particularly if purchased with an Amazon gift card. Anyone purchasing this product is not taking a risk of a substantial cash lose even if the product does not live up to purchaser expectations. Even so anyone considering purchasing this product may want to do some additional research on skin care products and their value or have a health care professional review this product prior to purchase. Jack Webster	reviewed Phytoceramides Bianca Naturals	on February 4th	 and gave it a rating of 2.